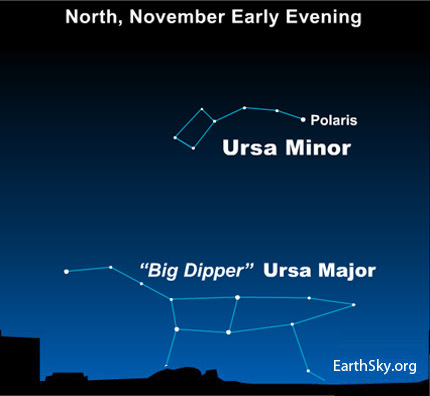 In our northern hemisphere, the Big Dipper is probably the sky’s best-known asterism. 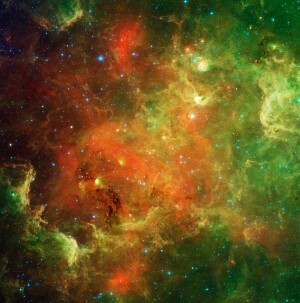 In other words, it’s a recognizable pattern of stars – not an official constellation. 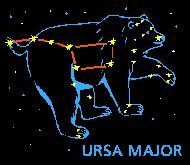 The Big Dipper is part of the constellation Ursa Major, otherwise known as the Great Bear. Every year, the Big Dipper (Great Bear) descends to its lowest point in the sky on November evenings. In fact, people in the southern part of the United States can’t see the Big Dipper in the evening right now, because it swings beneath their northern horizon. Even in the northern states, the Big Bear is hard to spot. The Big Dipper skims along the northern horizon in the evening, ducking behind any obstructions – such as trees and mountains. To the Micmac Indians living in southeast Canada, a Celestial Bear – our same familiar Big Dipper pattern – coming down to Earth signaled the start of hibernation season. This is when earthly bears return to their dens, and when the sap of trees returns to the warm womb of the underworld. Weary creation tucks in, waiting for winter’s deep slumber. The Micmacs saw the Big Dipper handle stars as hunters forever chasing Celestial Bear. In their skylore, hunters catch Celestial Bear each year in the fall, and it’s the dripping blood from the Bear that colors the autumn landscape. The painting at left is another portrayal of the Big Dipper in November. 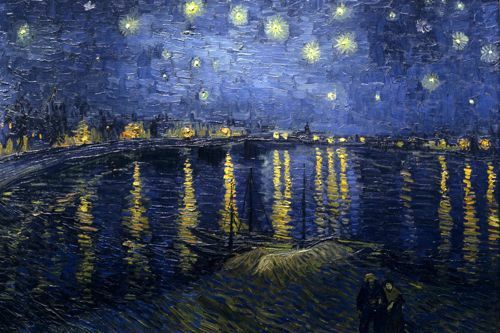 It is Vincent van Gogh’s Starry Night Over the Rhone, painted in September 1888 at Arles. This image – from Wikimedia Commons – depicts the Rhône River at night. Have you seen the Big Dipper in the configuration below? Can you see it tonight? Site contents copyright © 2019 Recorder Online	except as noted. All rights reserved. | 83 queries in 1.178 seconds.